These are not the no bake cookies you grew up with. Same great texture and flavors, but made with healthier ingredients. There is a surprise secret ingredient that I have added to my recipe…. By removing the oats, not only is this recipe for gluten free no bake cookies, but now grain free! You won’t even miss the oats, I promise…. These no bake cookies or “raggedy robbins” as we used to call them, are so simple to make and will surely please any crowd! 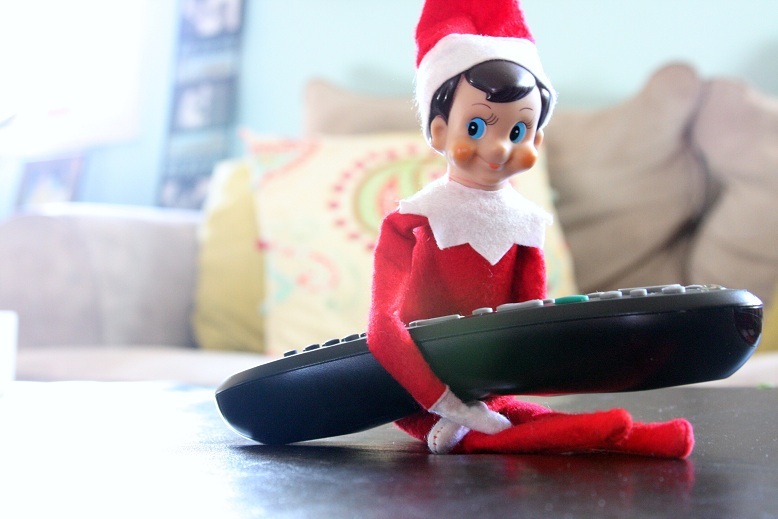 Apparently Bobby has been sneaking in some late night TV time…. This entry was posted in Gluten Free and tagged gluten free, gluten free no bake cookies, grain free, no bake cookies, paleo. Bookmark the permalink. Michelle….do you think Coconut Oil would work in place of the butter? I’m trying not to buy the butter sub. 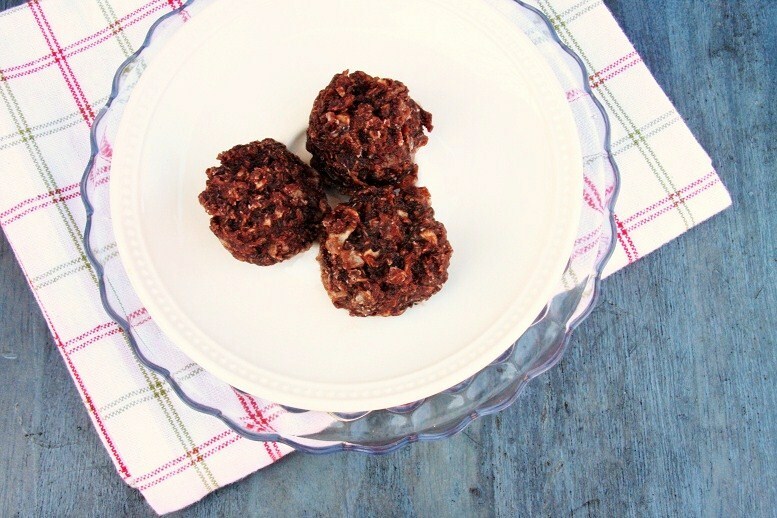 Love this–I’ve been looking for a grain-free version of no-bake cookies for awhile! Unfortunately, I don’t tolerate coconut flakes well…do you think using chopped nuts instead would work? It’d be more crunchy than chewy, but I’m okay with that…or would the chocolate mixture be too thin without the starch of the coconut flakes? I just made a batch with equal parts chopped walnuts and they turned out great! Can you use GF Oats & coconut flake combined? These are wonderful. They are now my favorite cookie. So simple and so tasty. I’ve substituted the peanut butter for either almond butter or sunflower seed butter. Both variations have turned out delicious. 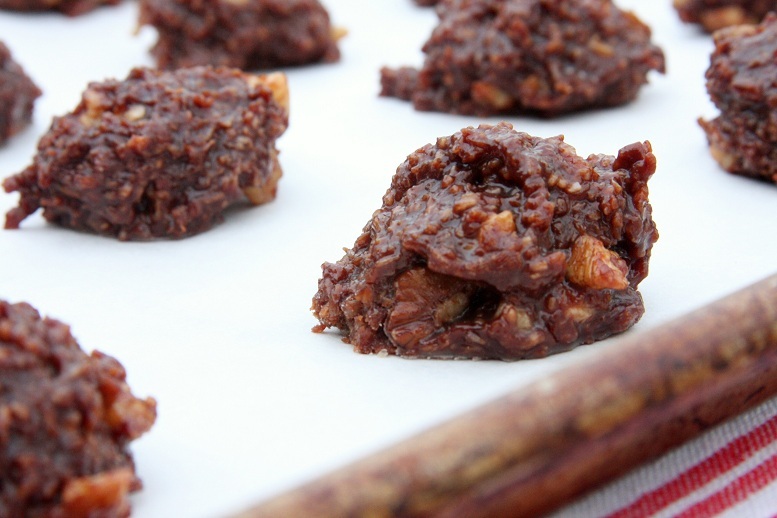 I just made these but did 2 cups GF oats and 1.5 cups of Raisins … they turned out wonderful. I would like to make this for a friend but I know very little about making things gluten free. Do I need to use “natural” peanut butter or is it ok to use Kraft? Most peanut butters are naturally gluten free, just check the label to be sure. I do use natural peanut butter, so if you go with another brand that has added sugar it will just make it a bit more sweet and could possible change the texture. I made these with coconut oil, almond butter, 2c coconut shreds & 1c chopped almonds. I ended up adding more almonds because they were way to soupy & I had to put them in the freezer to make them solid enough to pick up. Any idea what went wrong? Maybe I need to boil it for longer than one minute? Especially if using almonds? They did taste AMAZING!